A Pocket Escape Room game designed to be played alone or with a group of friends. The Eldorado expedition has failed: you have been searching for the legendary gold city for a long time in the heart of the jungle, without ever finding it. During the return flight, a statue head hits the plane and you have to drop by parachute! You are alone, tired and hungry, lost in the middle of an unexplored part of the forest. You only have a few items that you have caught before jumping. This could be your end ... or your very last chance to solve the Eldorado Mystery! 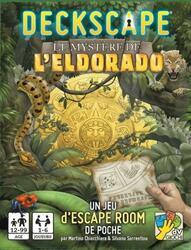 Will you be able to survive the traps of the Amazon rainforest and discover the legendary city of Eldorado?